Should I choose BDS over MBBS? Have you got your Medical Entrance results? Are you getting a seat in BDS course and not in MBBS course? You are in a dilemma, to choose BDS or drop one year more for MBBS? Many students consider BDS course of lower standard than MBBS as admission is easier in BDS. But there are lots of benefits that BDS has over MBBS that may motivate you to choose this course of study. It takes less time for the completion of the course than a MBBS degree. You can start working after the completion of the BDS course, while as you have to do MD/MS so as to be employable. The actual earning in case of a doctor starts very late, while as dentists enjoy earnings soon after completion of the course. Doctors as compared to dentists have a more demanding job and more working hours. The most important factor that distinguishes BDS and MBBS is the cost of the education. Moreover cosmetic dentistry is a lucrative career option now becoming popular. MBBS could be your first career choice option but if you find any of the arguments presented reasonable then you can opt for BDS as well. 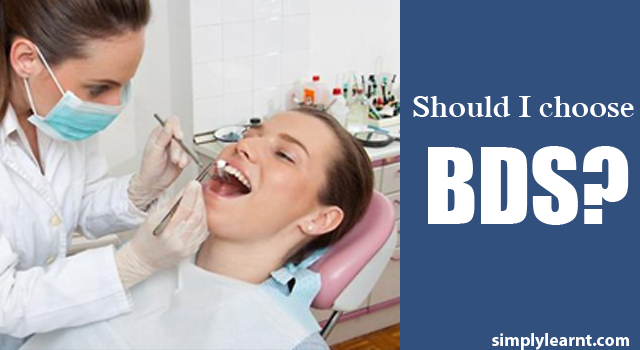 Patients consider dentists no lesser doctors especially when a tooth hurts. Admission to BDS courses happen through the same medical entrance exams as for MBBS. AIPMT is the national level medical entrance exam. Simplylearnt can provide you all the tools that you need to prepare for AIPMT examination with SMART subscription and test Series.